Cloe Muskett has a passion for hairdressing which has led to her beginning a school-based traineeship. 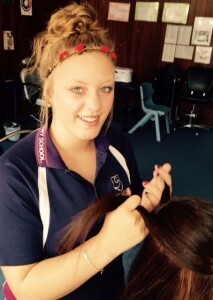 The Year 11 PASS student discovered this passion whilst studying Certificate II in Hairdressing through the YES Centre last year. The Vocational Education Training (VET) course is delivered by Mrs Belinda Myles, who suggested an apprenticeship in hairdressing as an option for Cloe. The VET students visited Pure Indulgence Hair Salon on the Westside regularly as a class to gain salon experience. Following that experience, Cloe, 16, went into the salon and asked owner Ms Rosie Lloyd if she could do work experience there on a regular basis. Cloe did two months of work experience, working around her school hours. She gave Ms Lloyd her resume and when a position as a trainee at the salon came up, Cloe was considered as an applicant and won the position. School-based apprenticeships allow students to complete their schooling while starting a trade. Cloe is a full-time student, studying to gain her SACE. She works at the salon after school, on Saturdays and during school holidays. “We love Cloe working in the salon,” Ms Lloyd said. As well as on-the-job training, Cloe travels to Adelaide to do trade school several times a year. A traineeship can lead into an apprenticeship and Mrs Myles said because Cloe completed the Certificate II in Hairdressing, if she began an apprenticeship she would have time taken off and would start trade school as a second-year.